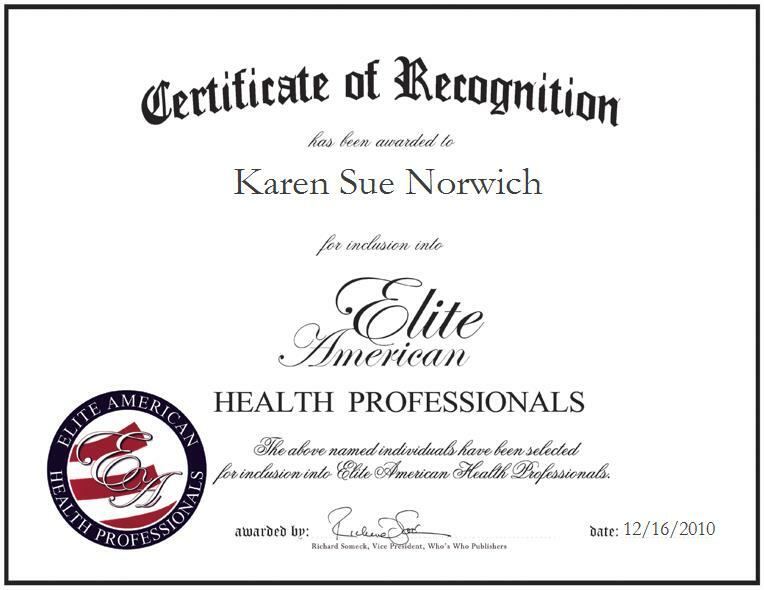 Kokomo, Indiana, December 16, 2010, Karen Norwich, Laboratory Technical Section Leader for the Howard Regional Health System, has been recognized by Elite American Health Professionals for dedication, achievements, and leadership in consulting. By employing her personal mantra of “the three C’s,” completion, compassion and continuity, Ms. Norwich has separated herself from others in her field and met with copious successes over the last 28 years. As a laboratory technical section leader, she is responsible for reviewing patient and exception reports, and overseeing critical values and performance improvements to assess and maintain the reputation of her department. When she is away from the lab, Ms. Norwich consults on quality assurance and problem solving with the Medical-Surgical Associates and the Community Internist Association. A diligent hard worker, Ms. Norwich considers the highlight of her career to be the two 100-percent scores that she received from COLA while working as a consultant. COLA inspections are unannounced assessments intended to ensure compliance with safety rules and regulations in a laboratory setting. The result is very telling of a facility’s commitment to excellence; thus, Ms. Norwich’s spearheading of two perfectly scored laboratories is a reflection of her true dedication to the field. Her willingness to adapt as the industry changes has led to her vast accomplishments as a health care professional. Ms. Norwich earned a master’s degree in management from the Indiana Wesleyan University in 1994. An affiliate of the American Society for Clinical Pathology, she advises those emerging in the industry to be flexible and stay on top of change. In the health care field, there are hundreds of new tests per year that arise and it is duly important to be open-minded and knowledgeable about such advances. She implores her successors to establish themselves as business-savvy professionals as well, and to collaborate with doctors to receive, and provide, guidance. As an expert in problem-solving, Ms. Norwich views every day as a new challenge. In her current capacity, she never works the same day twice. Having different responsibilities and varied assignments on a daily basis is the aspect of her job that Ms. Norwich enjoys the most. Prior to working for the Howard Regional Health System, she served as a laboratory technical consultant and bench technologist for the Medical-Surgical Associates, and a bench medical technologist, medical technology school program director and marketing and education supervisor for St. Joseph Hospital. With her perfectionism and compassion working as her greatest allies, Ms. Norwich intends to establish her own consulting firm in the future to parlay her comprehensive industry knowledge and experience onto others.